Home > Pain Relief > Which Drugs or Foods React With Antipyretic? Antipyretics are drugs that are manufactured to lower the bodies’ temperatures during illness, particularly a fever. 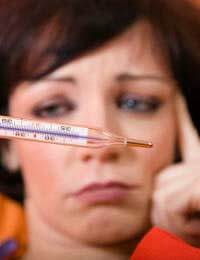 The word antipyretic literally means anti-fever and there is some debate about the drugs suitability as fever is the bodies’ natural immune response against infection. What Are Antipyretics Used For? Antipyretics are designed to not alter body temperature unless the patient actually has a fever, so despite the lowering of body temperature being the primary function of antipyretics they are most commonly used to reduce a sufferer’s pain. Paracetamol, Aspirin and Ibuprofen are the most well known antipyretics. They are used for a variety of ailments because they are fever reducing and also analgesic (pain relievers). Aspirin and Ibuprofen have a third role in that they are also anti-inflammatory.Because antipyretics are available over the counter without a prescription, people sometimes presume that there is no need to consider what other drugs or food may interact with them, but that is not the case. There is mounting evidence that caffeine and antihistamines can increase the effects of some antipyretics. In theory caffeine augments the pain relieving qualities of aspirin and ibuprofen, whilst antihistamines such as orphenadrine and phenyltoloxamine multiply the analgesic properties of acetaminophen. Antipyretics should only be taken with anti-coagulants for severe sinus headaches, as warafin (coumadin) in combination with antipyretics can cause major bleeding and toxicity which is potentially fatal. Aspirin also has the ability to antagonize the diuretic effects of spirinolactone which can then lead to dangerously low blood pressure. Aspirin should not be consumed by diabetics as taken in high doses it can enhance the effect of certain sugar reducing medications such as; glipizide (glucotrol), glyburide (diabeta) and tolbutamide (orinase) which would then lead to low blood sugar levels (hypoglycemia). Metaclopramide should not be taken either as it increases the aspirin’s absorption, which will make the antipyretic more potent than it would be regularly. Aspirin even has the strength to reverse the effects of probenecid (benemid.) When taking aspirin you should avoid or at least limit garlic, ginger and gingko whilst increasing your vitamin C intake.Aspirin should not be taken by those with ulcers, asthma, gout or hearing problems. Whilst ibuprofen must be avoided with several conditions such as nasal polyps, asthma, heart failure, plus liver or kidney problems. In the field of medicine it is strongly suspected that ibuprofen may increase blood levels of digoxin (lanoxin). Despite this belief it remains unclear whether the interaction is strong enough to warrant advising patients who are prescribed digoxin to not take ibuprofen. Naproxen Sodium is a form of antipyretic that should not be taken in tandem with any other antipyretics or analgeics.All antipyretics should be on no account be taken whilst on a course of steroids as they can increase the risk of gastro-internal bleeds. Finally as with virtually all pharmaceutical drugs, antipyretics should not be taken with alcohol, and aspirin should not be used to combat a hangover. Anyone who consumes more than 3 alcoholic drinks a day should consult a physician before taking antipyretics.